Left and Write: Q: Quasar! Wendell Vaughn was just your ordinary, run of the mill, 'everyman'...who just happened to graduate from the S.H.I.E.L.D academy. Recognized as a good man, Vaughn never made field agent due to his lack of that 'killer instinct'. Relegated to security details, one of his first jobs was at a facility where scientists were running tests on a pair of "Quantum Bands"...weapons used by the now deceased hero, The Crusader. The test pilot wearing the bands was able to use them quite well but, after a while, the quantum energy reached critical mass and fried him to death. Still studying them, the facility was attacked by the scientific terrorist group, A.I.M (Advanced Idea Mechanics) in a bid to steal the weapons. With little choice, Vaughn puts on the Quantum Bands and was quite successful in defeating the A.I.M. goons. As the power began to rise, ready to fry him, he decided to relax and 'go with the flow'. He had figured out that having a more flexible mind was the key to using the bands, not the rigid thinking that people with 'killer instincts' had. Of course, with such powerful weapons, Wendell decides to become a superhero. Calling himself "Marvel Boy", then "Marvel Man", then settling on "Quasar". Debuting back in Captain America #217 (January 1978) as Marvel Man, the character then went on to guest star in quite a few issues of Captain America, The Hulk, The Avengers, and Marvel Two-in-One. Wendell Vaughn has no inborn powers, but has been trained in many forms of hand to hand combat as well as basic espionage skills. 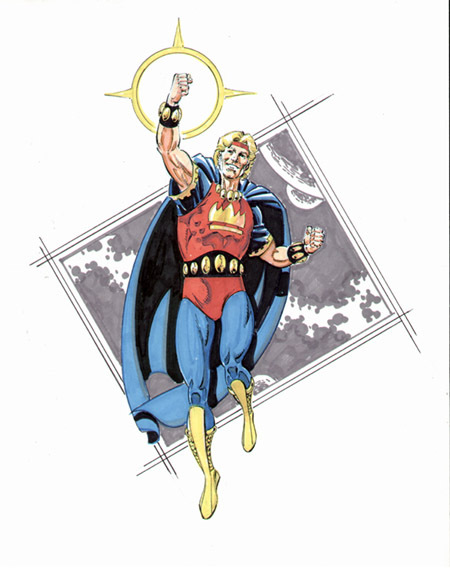 Quasar has always been the 'go to' hero when it came to stories involving space spanning, cosmic, themes in the Marvel Universe. Nice that he found a way to be a hero despite the obstacles. Good for him. I like the name Quasar, and it's nice he was able to find something that matched his talents. I love his name, and he was good looking as comic heroes go! I remember him, one of the only blond ones I liked. ooh, he has some great powers! I'm amazed at how many superheroes I've never heard of. Wonder if he'll show up in an Avengers movie? This makes me identify with him. I always enjoyed Quasar! A cheesy cosmic hero to the very end. I think he's still kicking around in Marvel's recent streak of cosmic tragedies. i love quasar... i think i have the the thing issue... he was a interesting qcat. I'm not as familiar with your topic as I could be, but Quasar *is* familiar! I recognize all these phrases 8-D SHIELD and AIM. I haven't heard of this hero though, though now I kind of hope he makes an appearance in one of the movies. He reminds me a little of Captain America, the more quiet type hero. You amaze me, Mark. 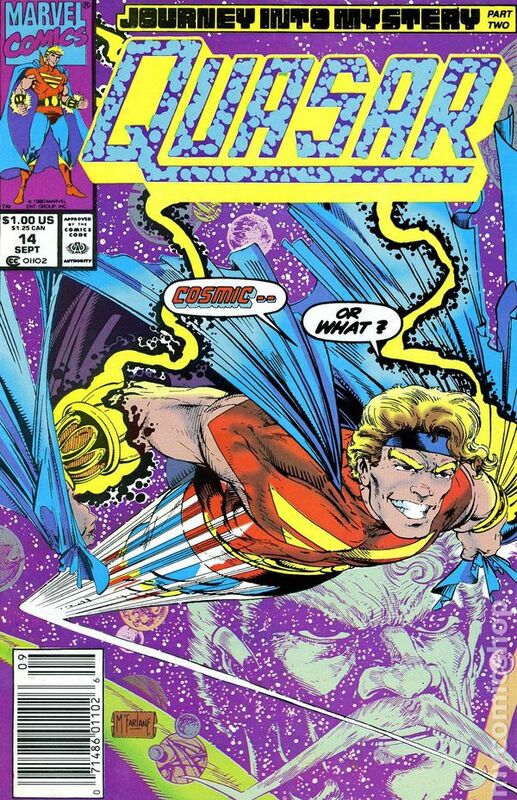 Did you read every single comic that ever came out with superheroes? I could use some of those quantum bands to get me out of work today and into a much better dimension. Quasar was a much better name. I think I need a pair of Quantum bands! That was quick thinking to put on those bands and save the day... He was definitely a hero!!! 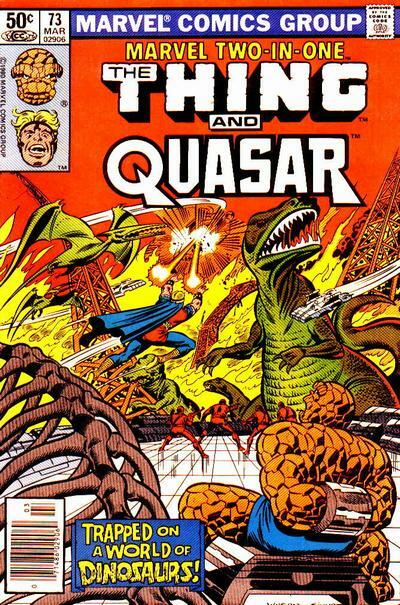 Quasar is definitely a much cooler name than Marvel Boy. Love how colorful the top mag is! I love that he found a way to be a hero without the "killer instinct." I definitively like this quazar guy. I was trying to think who you might use for Q. I've never heard of this guy, but those are some cool powers. Have a great weekend! I need some of those bands! The artwork is simply superb! Another new comic for me. I love the name Quasar. I wonder if he was named after the electronics company. Never heard of this guy but he sounds pretty awesome. He kind of resembles my uncle. I love his eyebrows! So I shouldn't feel bad when I can't think of a name for my character or it takes a couple of tries before the right title comes along! Quasar is cool. So awesome that he was able to use the power because he could go with the flow! There is something for everyone out there, even superpowers. Do rubber bands have anything to do with your unconventional hero tomorrow? Omigosh, I am totally geeking out over your theme! Awesome work, man! Quasar was the better name choice...glad he kept trying!